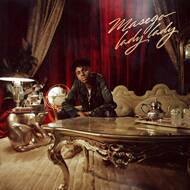 Lady Lady showcases multi-instrumentalist, singer, songwriter and producer Masego's many sides: funny and flirty, wide-eyed and coming-of-age, mysterious and moody. Throughout the 13-track collection of songs, his genre-defiant sound is on full display as he demonstrates a unique intersection of soul, trap, R&B, jazz, rap, and dance. It's been years since his first heartbreak, but Masego is still reconciling with the emotions tied to the event. In many ways, Lady Lady is a coming-of-age record that showcases all the sides of Masego's musical personality. At its core, all the songs reflect his experiences with women and how women made him see more of himself. The silky Sounwave-produced title track cements the Virginian-Jamaican artist as a swooning lady's man and jazz heartthrob, moving seamlessly between singing, rapping, and soloing on the saxophone.